Other = The Rusty Dwart has been a mainstay in the Rusty range for nearly a decade. We can’t really build a “better Dwart”, in fact plenty of people have tried and failed. Yet, with so many satisfied repeat customers we decided it was time to expand the family…Introducing the Dwart Too. The Dwart Too redirects the original mission a little bit, and refines a well-tuned machine into a precision alternative. 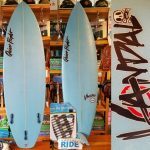 SPECIAL DEAL $299 Board, Leash, Tail pad, Wax, just add waves! 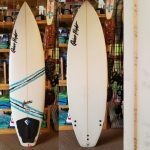 COME VISIT US, MOST SURFBOARDS UNDER $150 ARE NOT ON THIS WEBSITE! 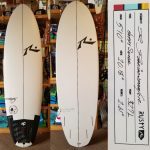 Other = The Chupacabra is a high volume groveler with a pure Venturi channel with no spine (the stringer stays up high at the center) to create speed. 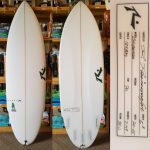 The board has very low rocker with a very light concave running through the center to flat in between the fins ending onto a very light vee at the end of the tail. It has a very high and pronounced wing that breaks the outline flow creating a quick turning point. 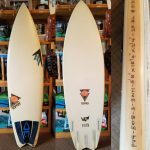 The tail is a generous round with planning surface, and yet tight turning arcs in the pocket.Thickness is concentrated on the chest area and it paddles very well and catches waves with ease. The Venturi and foam through the tail make this board extremely capable of connecting the flat spots, keeping the board always loaded with energy. The nose is not as wide as other grovelers, and the wide point considered “narrow”, the Chubacabra performs as a performance shortboard. It should be ridden at least 3” smaller than your short board. 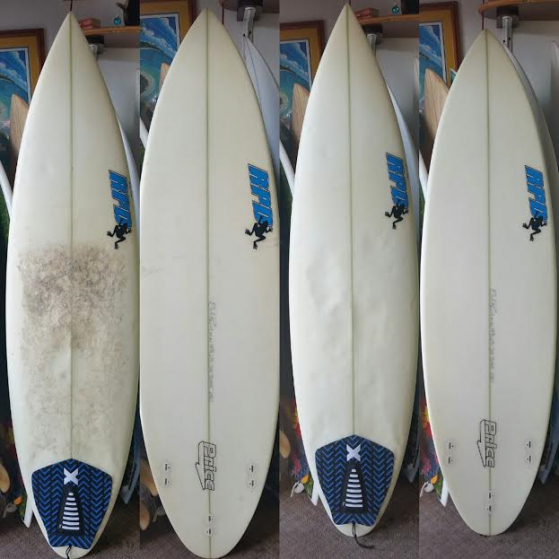 This model excels in small surf but is has been put to test in some decent surf with surprisingly good performance. 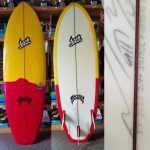 Other = Our latest board design for riding the smallest waves possible. 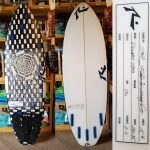 A board that feeds and thrives off the bottom end of the wave spectrum. I was feeling held back a bit by the wide noses on the Plank and Uber-Plank, and wanted to make a board with more outline curve and no wings, something more elliptical. This board has a lower entry rocker than I have ever done and uses rolled belly to keep it from catching. The belly continues through the center but features a double concave sitting inside it. Which creates a tri-plane hull featuring a soft chine in the rail. This feeds water through the hull and gives it a feeling closer to a concave bottom board. The tail features enough rail rocker and hip to allow aggressive direction changes in tiny surf without losing speed. A am feeling outlines that are more and more clean, with less wings and fancy, trendy tail shapes. This board showcases that concept. It’s designed as a quad, but it can be made a 5 fin as well. I prefer it with Future Fin boxes and fiberglass “controller” fins.